After the collapse of the Soviet Union, the Russian Navy was degraded and to all intents and purposes became nothing more than a coastal fleet. Today, due to limited economic resources, Russia has to focus on protecting its longest coastline – the Arctic. With this in mind, a new diesel-electric icebreaker is being developed for the Russian Navy. The task of protecting Russia’s Arctic coastline has always been assisted by the area’s specific geography. The region includes numerous islands, on which former Soviet military bases are now being restored, and the seas are covered with ice. This hinders the appearance in these latitudes of large marine forces, as well as reducing a potential enemy’s room for maneuver, while providing safe cover from aerospace reconnaissance for Russian submarines. However, these advantages create inconveniences for the Russian Navy as well. First of all, this concerns the supply of the troops and transfer of equipment and cargo, most of which has to be delivered by sea. To solve this problem, the Russian Navy has asked that a new type of diesel-electric icebreaker be developed. 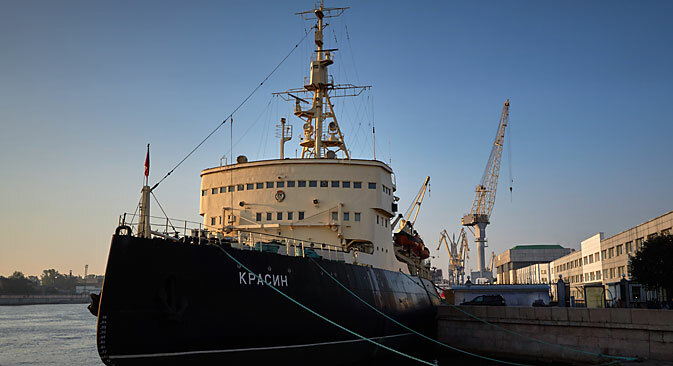 The keel of the first ship in this series was laid on April 23 – the vessel is named after Ilya Muromets, a Russian folktale hero who protects ordinary people from invaders and robbers. In Russia, there is a tradition of naming icebreakers after their predecessors. In this case, the “godfather” of the new ship was a project 97K icebreaker, also built in the Admiralty Shipyards back in 1965, which served in the Pacific Fleet until 1993. This ship has inherited its name from a predecessor vessel, which was built in England in 1916 for the needs of the Russian Navy. The fate of that Ilya Muromets was not so illustrious. After the outbreak of civil war in Russia, the Entente powers intervened in northern Russia, and among other things, they stole this ship, which completed its service life in the French Navy as a minelayer, under the name Pollux. The current ship is being created for the very purpose of preventing any invasion from hostile states through the territorial waters of Russia. It will become the first ship of this class built for the Russian Navy in the last 40 years. Its creators have tried to implement all available technological innovations into the vessel. “When the ship was being designed, they gave it the capabilities not of today’s icebreakers, but those of tomorrow. These include seaworthiness, maneuverability, versatility and a completely new electric principle of movement,” said Admiral Viktor Chirkov during the keel-laying ceremony for this ship. The new vessel will have a length of 85 meters, a width of almost 20 meters, a displacement of 6,000 tons, and will be able to spend 60 days at sea. A total of four ships of this project will be built. An important feature of the Ilya Muromets is the Azipod-type steerable propellers. These are secured to the hull by a hinge mechanism and can rotate 360 degrees about a vertical axis, which allows the ship to freely move forward, backward, and sideways. These capabilities are especially useful when operating the vessel as an ice tugboat. In 2017, the St. Andrew’s flag will be hoisted on the new icebreaker, and it will immediately begin escorting supply ships. Its hull can break through ice of up to 1 meter thick, which will allow it to operate over the entire length of the Northern Sea Route (NSR), ensuring that ships can travel from Murmansk in European Russia all the way to Petropavlovsk-Kamchatsky in the Far East. The ship has the capacity to easily cover this distance. The NSR will allow cargo to travel from the north of European Russia to the Far East 7–22 days faster than through the Suez Canal. Moreover, in this case, Russia will be shipping cargo through its own territorial waters, allowing it to proceed without regard to the decisions of other states, and in the event of war, these logistics will be considerably safer. Merchant shipping along the NSR has been steadily increasing since 2011. By 2019-2020, cargo shipments via this route will grow to 5 million tons per year. This requires that Russia be able to ensure the security of this shipping corridor in the interests of its own vessels and those of its closest partners, for example, China.